Kerning, spot UV, and brand perception vs. ROI, metrics, and profit margin. Do businesses and graphic designers even speak the same language? While it’s true that each area of expertise comes from a very different training background and is tuned in to different details, each brings valuable insight into marketing materials. 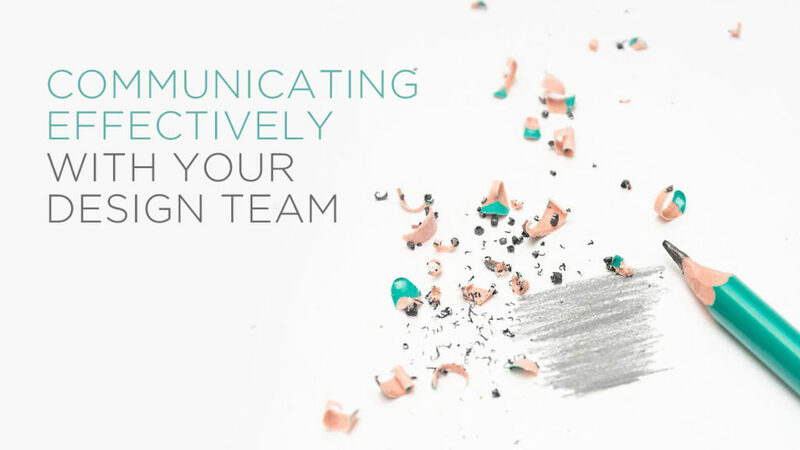 Unfortunately, communication mishaps can negatively impact the final product. Are you a business person working with a designer? Here are two steps to communicating effectively with your design team to achieve the best results on your next design project. A Project Brief is a document that defines all the requirements of a project. It is used to guide the creative team’s process and it helps define what success looks like for each specific project. This may seem like an unnecessary step, especially if the design agency is familiar with your company, but our advice is not to skip this step. It’s helpful for the company to ensure their overarching goals and mission are at the forefront of the designer’s (and the consumers’) minds. It also ensures that everyone is starting from the same starting point instead of unwritten assumptions. Here are some elements that are found in a helpful brief. Chances are your organization already has this information detailed, but if not, this is great motivation to get your business description finalized and on paper! Positioning statement. Describes what makes your company/product unique. If you don’t have a company positioning statement and want more detail on how to write one, read this article. Overview/background. Briefly describe your company and what it does. This is also known as the elevator pitch. If you have 30 seconds in an elevator with a potential client or customer, what would you want them to know about your company? Tips on crafting an effective elevator pitch can be found here. Target Audience. Briefly describe demographics of your clients. No designer or agency can craft a website that appeals to everyone. And, if someone is promising to do this, call their bluff! In order for your site to be successful, the design team needs to know as much about your target as possible. For tips on identifying and defining your target market, read this. Competitors. List your direct and indirect competitors. The last thing you want is for your brand new design to look reminiscent of your biggest competitor. Or, if all of your competitors are offering online web quotes, this might be something you discover that you need to offer on your new site to stay competitive. For ideas on finding and keeping tabs on your competitors, click here. Brand personality. Be as objective as you can and list adjectives that describe your brand. Is it playful, aggressive, serious, diligent, compassionate, professional, etc? Here are some examples for inspiration. Start Broad. Provide big picture design considerations. Focus on the overall look and feel and goals. Stay Broad. Don’t get lost in the details. We’ve watched companies spend time, energy, and money debating design issues while losing sight of overall functionality and user experience. We love when clients have direction for us, and through their vision, we have created some wonderfully unique design projects. However, certain types of direction can be limiting. Here are some examples of what helps and what doesn’t. Mircro-mange design with too-specific requests (“I want green here, red here, avoid pink because it reminds me of my grandma, use this photo in this exact spot…”). Provide a design mock up to be copied exactly (“I sketched this out and think our site should look just like this”). Provide an existing site and ask us to make yours just like it. Think you need to have an exact solution figured out. It’s perfectly fine to bring a problem or challenge to us and let us find possible solutions. After all, when you are sick, a doctor doesn’t expect you to arrive with a full diagnosis in hand. By giving the design agency overly specific design direction, you lose the opportunity to take advantage of the designer’s expertise. Instead your design becomes limited. One of the things that designers struggle with is watching a great design become less and less effective because a client is leaning on their personal taste instead of trusting our experience, knowledge, and expertise. And of course, ask plenty of questions and raise any concerns you have. Your design team is an extension of your company and you share the same goal—an effective end product. The design process is a fun and exciting road to travel. Through a skilled design team, you will watch your business and services shine. We hope these tips have been helpful as you navigate the design process! Kristin discovered her calling at the age of 12 when she saw the Twist to Open Miller Lite commercial and decided she wanted to make ads for a living. After convincing her parents she wouldn’t be a starving artist, Kristin headed to Kalamazoo College where she double majored in art and psychology. Later, she attended Ontario College of Art and Design and received a masters in advertising design. Kristin has designed a wide range of award-winning materials for businesses, publishers, and authors, including Ben Carson, Zondervan, Yates and Yates, David C Cook, Jon Acuff, Chemical Bank and Hawaiian Isles Coffee. When she’s not working Photoshop magic, Kristin enjoys hiking, going to the beach, SUP, and spending time with her two girls.